2 How to Deactivate or Unsubscribe or Cancel Banglalink Free Facebook Offer 2017? Banglalink Free Facebook browsing from 6 AM to 10 AM! All the Banglalink prepaid and call & control subscribers are eligible to enjoy BL Free Facebook browsing 6 am to 10 am. There are some terms & condition to Use Banglalink Free Facebook Offer 2017. If you want to know the BL Free Facebook Browsing Offer 2017, just follow the below. To activate Banglalink Facebook Free Offer 2017, customers need to Dial USSD code *5000*111#. 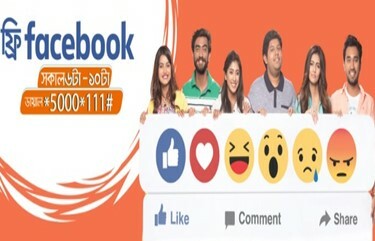 Customers can use this BL Free Facebook Offer 2017 only Morning Time that’s means from 6 A.M. to 10 P.M.
After activating this Banglalink Free FB Offer 2017, customers use everyday maximum 300 MB Internet. If customer uses over the 300 MB Internet, customers will be charged from Main Banglalink Internet Package Balance or Main Balance. To check the Balance of Banglalink Free FB Offer, just Dial *124*26#. This BL Free FB Offer 2017 is a limited time offer. How to Deactivate or Unsubscribe or Cancel Banglalink Free Facebook Offer 2017? It is very easy to Cancel, Deactivate or Unsubscribe Banglalink Free Facebook browsing from 6 AM to 10 AM Offer 2017. Just go to the Dial option and Dial *5000*112#. Thanks for staying with us a long time and visiting Banglalink Free Facebook browsing from 6 AM to 10 AM Offer 2017. If you have any confusion or question or want to know more about Banglalink Free FB Offer 2017, Just comment here.